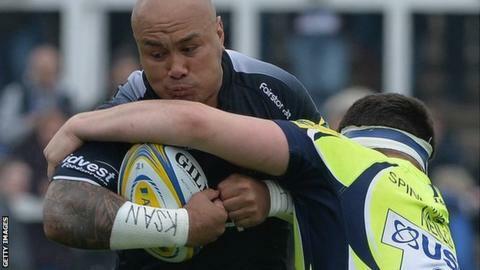 Sale beat Newcastle to seal a Champions Cup place ahead of Harlequins, despite Nili Latu's hat-trick for the Falcons. David Seymour went over to give the Sharks an early lead but, after Wasps-bound Danny Cipriani kicked a penalty, Latu's opener reduced the deficit. Sam James touched down for Sale's second try, with Cipriani adding the extras, before Latu scored again. The Tonga captain then made it 15-15 after the break before two Joe Ford penalties secured sixth spot for Sale. They moved above Harlequins, who were thrashed 62-24 by Exeter Chiefs on the final day of the campaign. Latu's hat-trick came in the same week that the 34-year-old agreed a contract extension with the Falcons, who finished 11th in the Premiership, seven points clear of bottom club London Irish. "We wanted to express ourselves today and to win the game. But we made a lot of unforced errors which cost us the game. "I've said it all year that someone was going to cop it and it should have been Sale today, but we have to look at ourselves and it's our fault we lost. "It's been a frustrating season - we should be halfway up the table but that's not the case." "We've come up here to win and we did - but it's never easy and it wasn't today. "Joe came on and slotted two vital kicks and stepped into the breech when we had an injury to Mike Haley and that was difference in the second half. "Newcastle couldn't live with us for the first 20 minutes, but fair play to them, they got back in the game and every time they went to the corner we struggled to cope and they scored. "We knew it would be a battle and I think we got the rub of the green and were lucky to win, but time and time again we prove we have a relentless desire to be at the top of the game. Newcastle Falcons: Hammersley; Tait, Harris, Socino, Watson; Delany, Young; Vickers, Hawkins, Cusack, Green, Witty, Wilson, Temm, Latu (capt). Replacements: Lawson, Rogers, Vea, Thompson, Mayhew, Takulua, Wills, Agulla. Sale Sharks: Haley; Addison, James, Leota, Edwards; Cipriani, Stringer; Lewis-Roberts, Taylor, Cobilas, Evans, Ostrikov, Neild, Seymour (capt), Ioane. Replacements: Briggs, Harrison, Mujati, Mills, Easter, Mitchell, Ford, Jennings.